Tottenham Fans, Rejoice! Your Team Got Beat Down Today! Even the most fervent Tottenham fan had to admit that it looked shaky out there for a bit. By the end, though, supporters could be proud of the scoreline their boys had earned. To further their hopes at ending the season with the trophy they so covet, Spurs’ players had one objective in today’s Europa League clash with Borussia Dortmund: lose, and lose big. Mauricio Pochettino wisely selected a less-than-ideal lineup to ensure his squad would come home with the desired result. Of the group selected to start today’s game, only four of them can count themselves as regular starters. It was clear from before the first whistle that Pochettino set out a team of hungry, lesser-used players in hopes that, in spite of their best efforts to contend with a strong BVB team, his side would ultimately emerge as well-deserved losers. The game ended 3-0, to the delight of both sets of supporters. 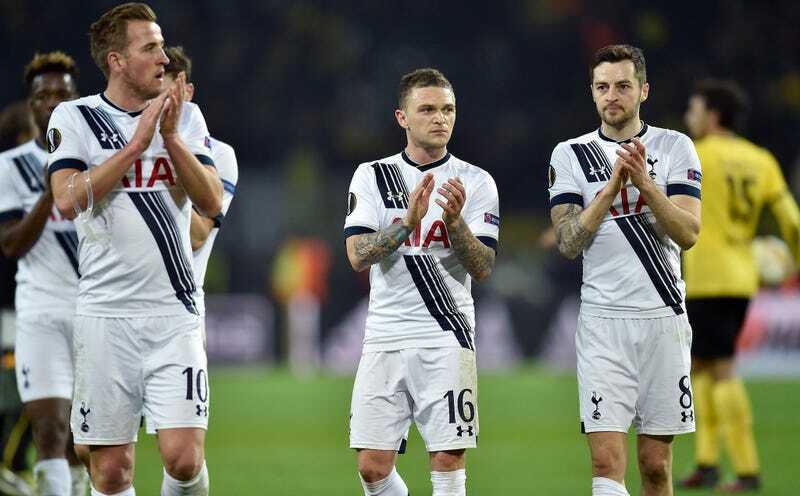 This loss could prove very important for Tottenham as the season wears on. Barring a calamitous result in the second leg of this Round of 16 tie—like, say, a 4-0 win—today’s game should guarantee their exit from the Europa League. Which, for them this season, is just perfect. Pochettino is certainly aware of the proven deleterious effects of a team playing matches on only two days’ rest—which is a regular occurrence for Premier League teams playing in Europe on Thursday, then back in the league on Sunday. Teams on short rest suffer a greater risk for injuries, are less likely to win matches, are more likely to concede goals, and are less likely to score late in the second game. So while the Europa League—especially now that the winner is given a spot in the next season’s Champions League if they haven’t already qualified for it through their league position—does offer its own distinct charm and reward for its ultimate winner, Tottenham are smart to want out of it now. Because Spurs are practically locks to secure a Champions League spot via their league record, and currently own have a once-in-a-lifetime chance to possibly win the thing. They need to focus all attention, resources, and energy on their domestic competition. That’s why coming home with a decisive L was so important for Tottenham today, and why they can be rightfully ecstatic at having gotten it. By losing today, Tottenham gave themselves a great shot to win big.